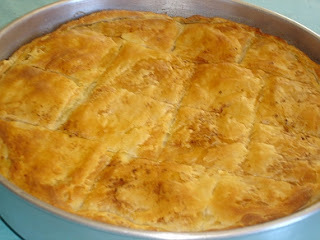 This is a delicious pie, not only the filling, but the lovely pastry as well. Because of the importance of the way the pastry is made, we have included photos of the various stages so that you can see it clearly. While the leeks are still warm, mix in the eggs, cheese and butter. Heat the olive oil in a pan, add the onion and sauté for 2 minutes. Add the mincemeat and sauté for another 5 minutes. Add 1 cup water, the fennel, salt and pepper, mix well and simmer until there is no liquid – approx. 20 minutes. Add the mincemeat to the leek mixture and mix well. 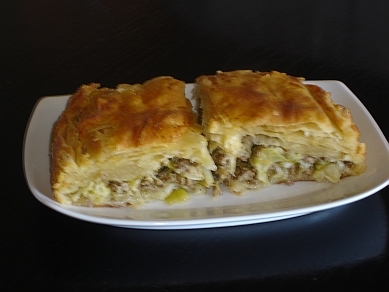 Put the mincemeat and leek filling on top of it. I will try this. Is ok if I use potato instead of leek in case I don't have it.